Since early 2012 we’ve been monitoring a range of non-traditional sources, searching for links and references to published research. Today the Altmetric database contains 60 million mentions of over 9 million research outputs (including journal articles, datasets, images, white papers, reports and more), and is constantly growing. Once we’ve picked up a mention of the research, we collate it together with any other online attention we’ve seen for that item and display it via the Altmetric details page, along with it’s own unique donut and automatically calculated Altmetric Attention Score. You can find more information on the sources we monitor here. 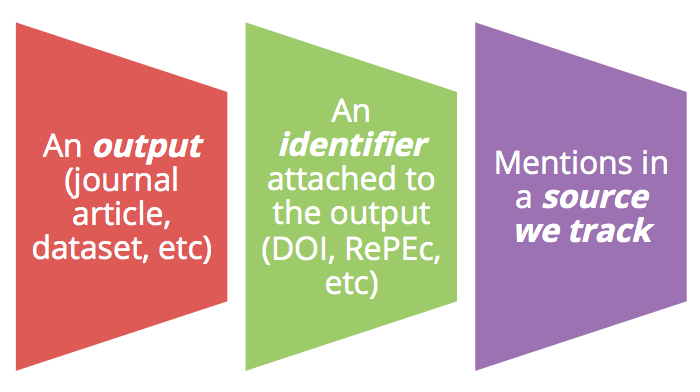 These identifiers also help us to recognize different versions of the same research output. For example, a journal article might be originally made available on a publisher platform and given a DOI, and then later hosted on PubMed or an institutional repository and given another unique identifier there. 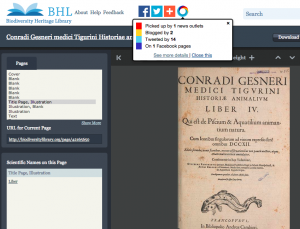 Our system cross-checks these to match them together, ensuring that the details page always displays a collated record of attention for all versions of the research item. Not got a scholarly identifier? Don’t worry – we also have the technology to track items by their unique Uniform Research Identifier (for example, a URL is a type of URI). This requires custom work from our developers and we invite you to get in touch if this is of interest. So far we’ve worked with institutions, funders, think-tanks and publishers to track attention to their press releases, grey literature and company reports, and there’s scope for much more! You can see an example of this type of tracking on the Biodiversity Heritage Library’s online platform. Got identifiers but worried we’re not picking up mentions to your content? Please let us know – the domain where it’s hosted may not yet be on our whitelist (all of the major publishers and platforms are), or it may be a small issue with the metadata of the page.